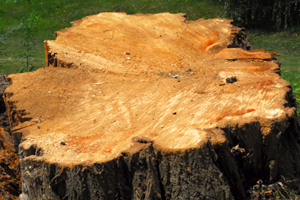 Stump Grinding is a service we offer after a tree is removed from your property, or if you have an old stump that you are ready to get rid of. It is the best way to reclaim part of your yard that would be otherwise useless with a stump just taking up space. Our Company uses a state of the art Rayco walk-behind stump grinder that is easily maneuvered to access even hard to reach stumps. Its a very powerful machine and does a great job at grinding down the stump. When you call us for a stump removal, or choose the service after your trees was removed, all we have to do is bring the stump grinder to the house, if it’s not already there, unload it off the trailer, and drive it to the stump to begin the grinding. The size of the stump determines how long this will take, but usually no longer than an hour before it’s gone! 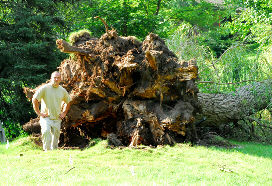 We do every size stumps, from a bunch of little ones to huge ones that have been uprooted. Any size we can handle! It is also better for your lawn since a truck does not need to tow it to the stump, so there won’t be any truck tire marks messing up your grass. Also, we do not outsource our stump grinding jobs like some other tree services may do , which keeps our prices affordable for you. For the obvious reason that it is aesthetically pleasing, stump removal is also a good idea when you would like to do more with the area, in terms of planting or construction. Stumps can also be a hazard if they are in your yard. If there are kids running around they can trip on them which can be dangerous. They can also make it harder to mow your lawn if they are in the way. Leaving them alone for nature to deal with can take a long time, and in the meantime the stump would be a habitat and breeding ground for insects and parasites that you may not want around your other trees. Once you have the stump ground, the mulch fills up the hole from the stump and will decompose over time. To accelerate that process you can add bone meal, which will put some nitrogen back into the soil that the wood takes out when they decompose. Put some topsoil over and you can plant grass easily.